In case you hadn’t heard, the New England Patriots played their worst game of the season last night. A team that had savored, not merely defeating, but blowing out their opponents failed in their quest for perfection. For at least a little longer, the 1972 Miami Dolphins will hold onto their place in NFL history as the last team to end a season with a perfect record. 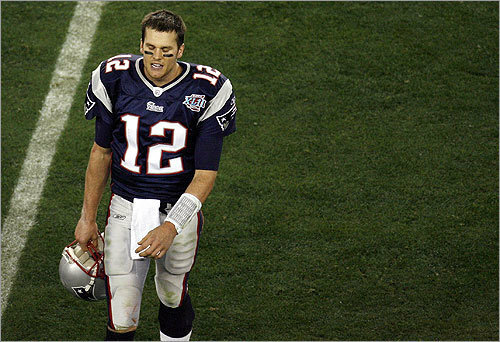 For Pats fans, like us, last night’s defeat was as shocking as it was untimely. And, really, who in their right mind would have thought that the Giants would win? Sure, some of the Giants players and die-hard fans were confident (or at least claimed to be), but the folks betting in Vegas certainly weren’t: the Pats were favored to win by 12 points. It sort of reminds us of another big and recent Super Bowl upset: the up-start and “lucky” Patriots defeating the allegedly indomitable St. Louis Rams back in 2002 in Super Bowl XXXVI. That one felt good, though. But, if sports bloggers and commentators are to be believed, perhaps we should take heart. Apparently, much more is revealed by the outcome of this football game than simply the fact that Belichick’s boys are not the best team in the history of the sport. The team’s lackluster performance allegedly proved something far more important than that. According to these commentators, by losing the Super Bowl in nail-biting fashion, the Patriots revealed that behind imperfection is a deeper and more affirming perfection: the universe is just. The only thing that left the Super Bowl undefeated was karma. For everyone who believes in truth, justice and a great American underdog story, the New York Giants kicked New England in the asterisk with a stunning 17-14 victory. Talk about your perfect ending. Sorry, Pats. Cheaters never prosper. Early in the season, [the Patriots] were caught videotaping the defensive signals of their opponents in a game. This is illegal and considered cheating. The results of the game were let stand, but the coach was fined 1 million dollars and the Patriots lost a draft choice in the 2008 draft. Now, it seems to me, that the perfect season up to the Super Bowl was simply Krishna setting them up, as karma for their cheating, for the ultimate pain — losing not only the Super Bowl but the chance at a historical 19-0 season. If you wanted to cause the team an enormous amount of pain for the cheating, what better way than to let them get so tantalizingly close. They had the lead with only 2 minutes left in the game, and then victory was snatched from their jaws by the Giants’ game winning miracle drive. Anyone who has played in a meaningful game knows what the pain of defeat can be, and in this case it was amplified to a huge degree. The cheating was nectar in the beginning that became poison in the end . . . . Karma is inexorable. If there was any moment that summed up why the Patriots deserved to lose this Super Bowl, it was Bill Belichick deciding not to remain on the field for the final second of the game. It was a classless move by a classless coach, but there was also much more to it than that. It was a microcosm of the entire Patriots season. Because . . . the truth is that this year’s Patriots team, and their fans, pushed the envelope like no team ever has before. And in the end, it came back to nail them in crushing fashion. Just as the single moment was a microcosm for the season, the football season is a microcosm for life. So take heart Patriots fans. Take heart Giants fans. Take heart everyone! What goes around, comes around. If not sooner, then sometime later—perhaps even in the final seconds of the last quarter of the ultimate contest—good will triumph over evil. Or so the human animal likes to believe. This entry was posted on February 5, 2008 at 5:01 pm	and is filed under Ideology, Situationist Sports, System Legitimacy. You can follow any responses to this entry through the RSS 2.0 feed. You can leave a response, or trackback from your own site.